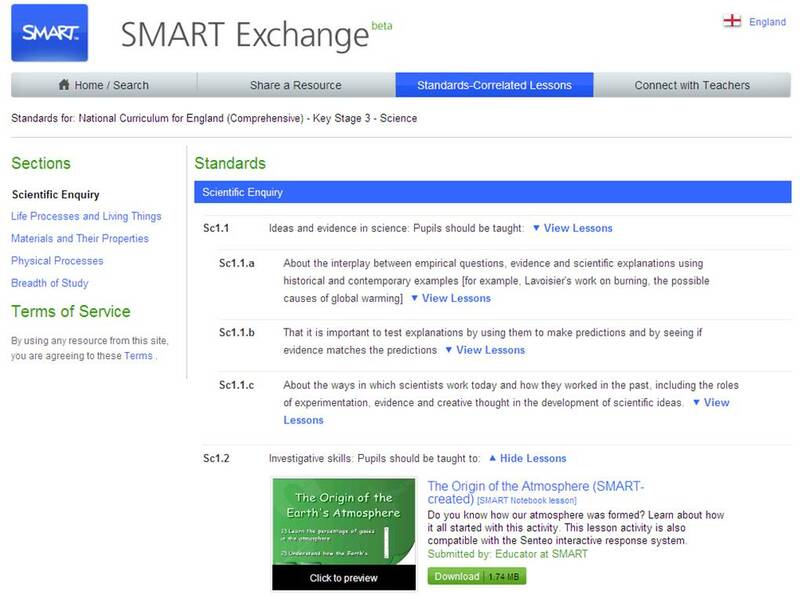 The new SMART Exchange has been set up to enable teachers to quickly search and find SMART related resources many of which have been produced and shared by other teachers. The new SMART Exchange streamlines the way in which you can search for resources, enabling you to browse via subject and also via subject-correlated standards – i.e. KS2, KS3, KS4. The search engine directly links resources to areas of the National Curriculum (see Science example below) enabling a focused search and providing a valuable and time-saving source of resources. It is also possible to search across different areas, the link above will take you straight to the ‘England’ area site but this can be easily changed to search other areas and associated curriculum resources e.g. USA, Germany etc. The whole idea of SMART Exchange is that it is a community for teachers using SMART resources and as well as contributing to the community by sharing your own resources (an easy uploading system is available on the homepage) you can also join the discussion forum in the ‘Connect with Teachers’ section to connect with other teachers from around the country. The following video from the SMART exchange team provides a guided tour of the new SMART Exchange facility. During the first ICT in Practice meeting as well as the ideas discussed in the previous posts, I looked at 10 practical tips, tricks and activities for using your IWB for getting started in creating resources using notebook. Staff from St Ivo can download the notebook file I used here (password protected – see me); however anyone who uses SMART board can access any of the special activity tools which are available from SMART in the SMART Lesson Activity toolkit (instructions for access and downloading here). We all know that good lessons require clear lesson objectives which are not only clear to us but to the students as well. There are various ways in which we can share our objectives with students and tools on the IWB help provide some new ideas for doing this which are also designed to help staff keep reinforcing objectives throughout a lesson. 1. 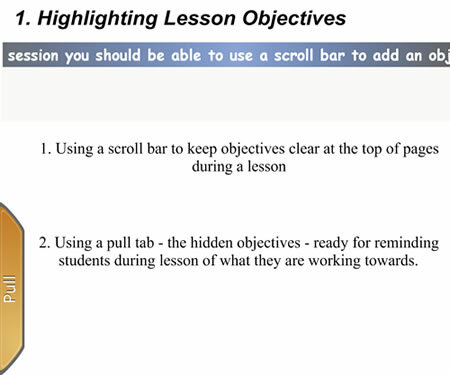 The Scroll Bar tool which can be found in the SMART lesson activity toolkit can be used to keep objectives visible during a lesson, or to highlight individual objectives relevant to a particular part of the lesson, by simply being embedded at the top or bottom of a SMART notebook page. 3. Select the text by clicking on it, then hold down the ctrl (control) button and select the rectangle as well. 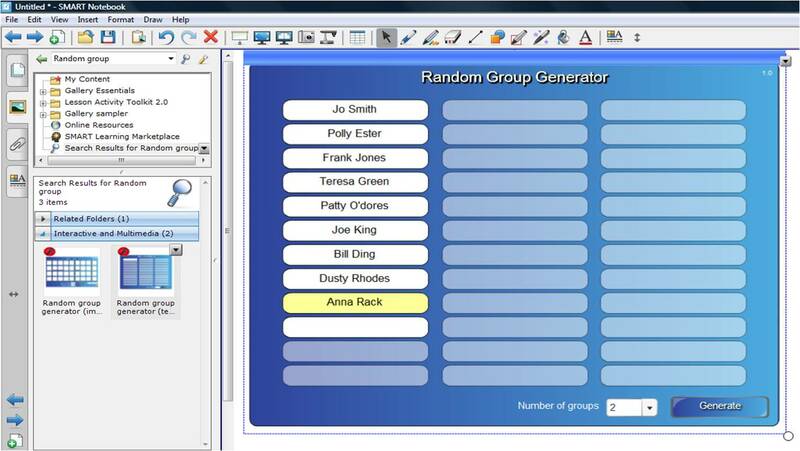 Right click and select ‘Grouping’ and then ‘Group. 4. You then need to get the ‘Pull tab’ graphic – to select this click on the Gallery and select the lesson activity toolkit – choose ‘Graphics’ from the list and then select ‘Pull Tabs’ – if they are not shown, click on the ‘Picture and Backgrounds’ tab to show all pull tabs available. Simply choose the one you want and drag it over to the notebook page and position it next to your text box. 6. You have now created one object which you can drag to the side with just pull showing to drag out whenever needed! Both of these tools could of course be put to other uses – e.g. reminders of key dates, reminders regarding homework, key vocab words required during a lesson constantly scrolling round the top of a page etc! You can easily INSERT video files into your notebook file, however to insert them within a notebook page they will need to be in the format of a Flash Video file. You can easily convert files from their original format to .flv (Flash Video format) using the Zamzar tool. You can also use this tool to easily download useful video clips from YouTube and other online video sites which you can then use in your lessons. For full instruction of how to do this, see my other post on Capturing Digital Video. Once you have your video file ready, simply open up SMART notebook, click on Insert, select Flash Video File.., browse to the location of your file, select and click open. Annotating your video! If you are trying to analyse the video content, for example looking at a screenplay in Media Studies, studying character profiles in a Shakespeare play in English, looking at landform formation in geography etc. 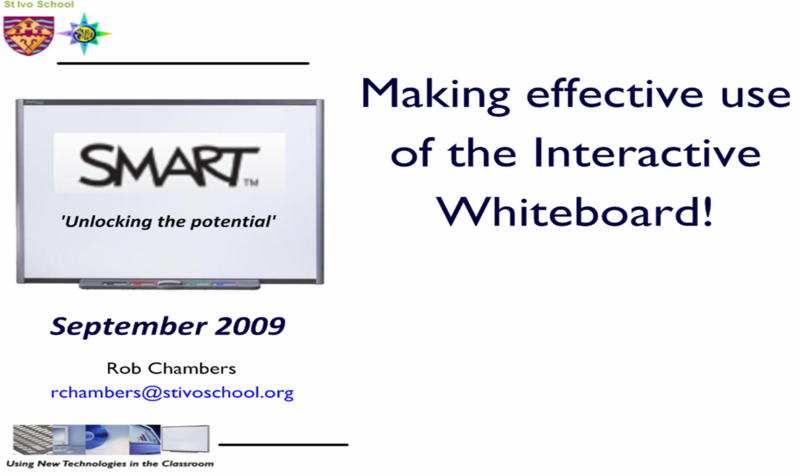 it is possible to pause the video at the point you want to talk about, discuss and add annotations to the paused clip using the SMARTboard pens. Then simply use the capture tool to take a screen shot of your annotated video – this will put a copy of the screen with the annotations into another page of the notebook. To continue watching the video, simply get rid of the annotations quickly (this can be done by selecting the eraser, circling the whole area you want to erase and double click in the middle – the annotations will disappear – you can use this trick to erase any large areas of text, drawing etc. that you don’t want!). 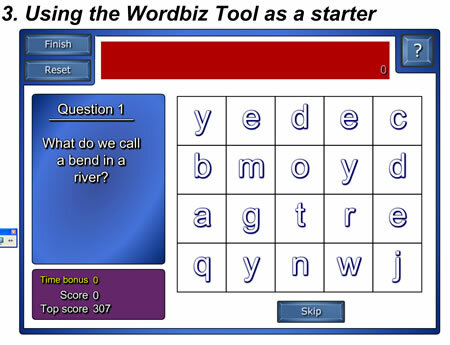 Wordbiz is one of the interactive activities taken straight from the SMART lesson activity toolkit. To access this select the Gallery tab, then ‘Games’ and then ‘wordbiz’. 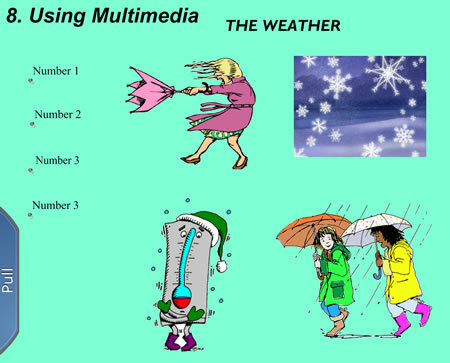 This is great for testing vocabulary and a nice little starter or plenary activity. To edit and add questions, simply drag Wordbiz from the gallery to your notebook page. Then select edit and your questions and answers (you can have up to 8 questions). 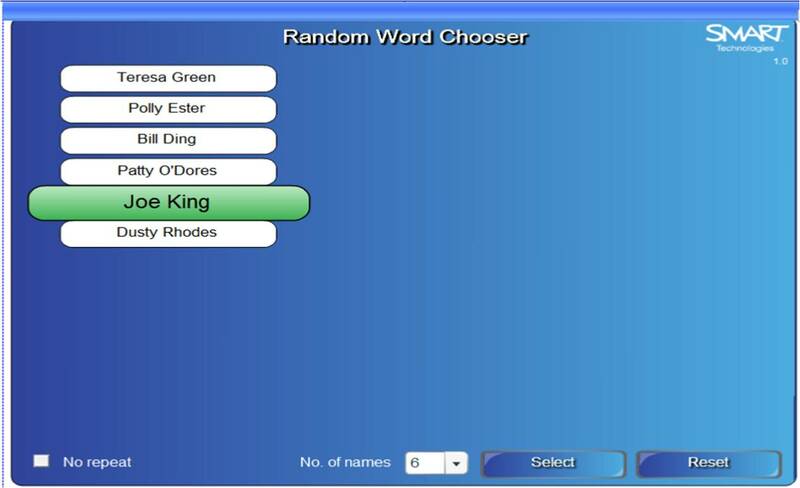 To play the game, students are given the question and they have to use the letters given to spell out the key word correctly in the time allowed. Good for checking both vocab development and spelling!! This is a great little tool from the SMART lesson activity toolkit. 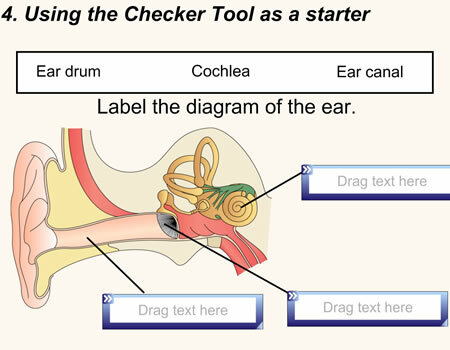 To find it, go to the Gallery tab and select Learning Activity Toolkit – click on ‘Tools’ and then ‘Tools’ again, click on where it says ‘Interactive and Multimedia ‘ and find the checker tool – drag it across to the notebook page to use it. You can add as many as you like! You then need to add a word box of possible labels which students can choose from. IMPORTANT – you must make sure you create each label separately so they can be dragged separately. Now you need to add arrows or lines to the parts of the diagram you want labelled using the line tool (again I suggest you lock these in place). Now its ready to be used! When the correct label is dragged onto the checker tool – it will say ‘Good job’ or if wrong ‘try again’. 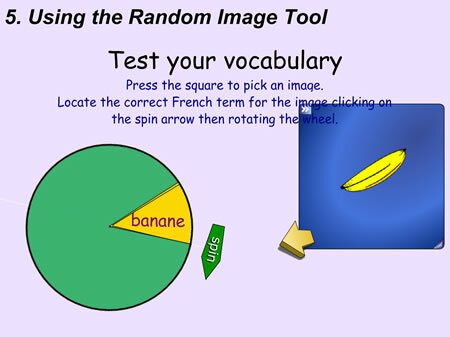 This enables you to collect together a set of images which will then be shown randomly when you click on the tool. 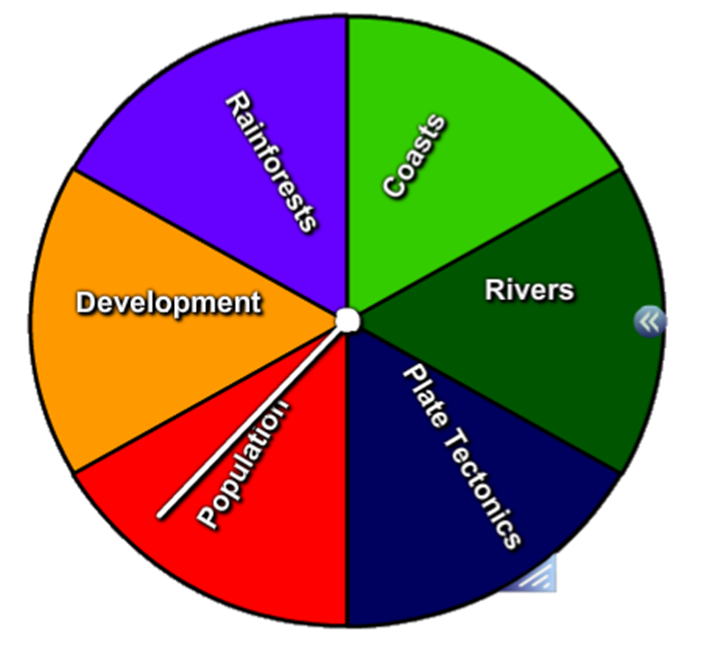 There are many possible uses, for example in geography, different landforms which you want students to then explain the characteristics and formation of; in history, characters from the past that students then are asked questions about; in languages objects for students to give the translation of etc. you can just keep dragging images on to the tool to add more. The example in the screenshot, which I showed yesterday is available for download in the Tools_Examples part of the Lesson Activity Toolkit. 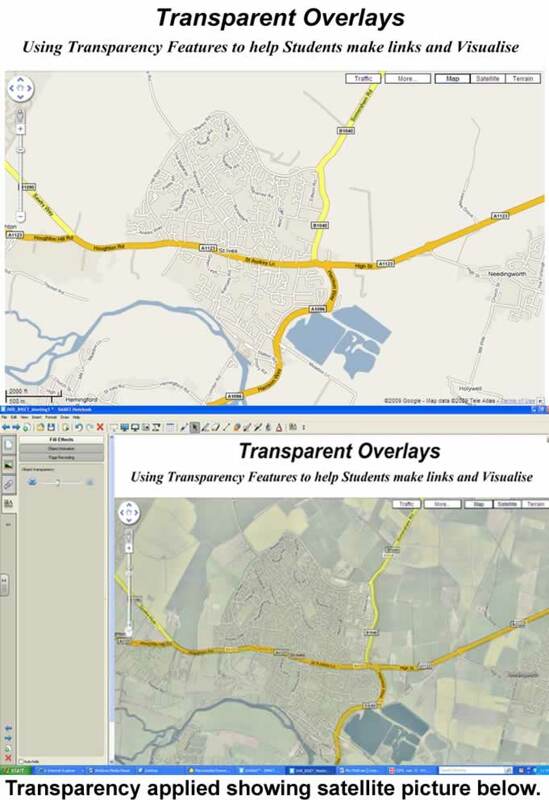 There are other great tools simillar to this in the Toolkit which are well worth exploring – e.g. random word generator, random number generator, dice etc. Enjoy! All we are doing here is using different coloured text and backgrounds to make words or sentences visible and invisible. This is useful for setting quiz questions on the board which you can then easily go over with the class and can be put to use in many different curriculum subjects. Simply begin by creating a rectangle on either the left or right hand side of the page. Right click on the rectangle and select properties and then using “Fill Effects” choose a colour to fill your rectangle, a mid-tone colour works best. If it is too dark, black wont show up and if it is too light white wont show up, but you can play around with what works best for you. Create your text by the side of the rectangle – this could be quiz questions and their answers, key terms and their definitions, mathematical equations and their answers etc. You must however make sure that you create it as one selectable piece of text, do not break the question and answer into two. Then select the answer / definition etc. that you want initially to be invisible by highlighting it and from the font format box change the text colour to white. 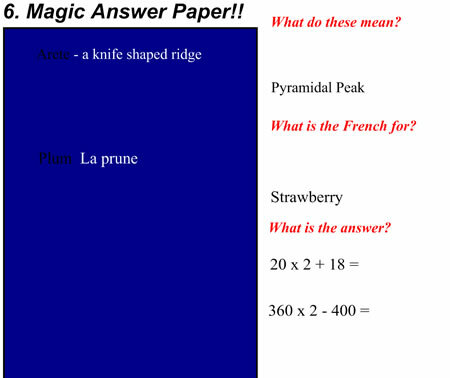 When you then drag this over onto your magic paper, both the question and answer will appear, when you drag it back the ‘answer’ will disappear as the white text once again blends with the white background – simple! In this example I took a clipart image of an envelope and put it in the middle of my notebook page. Around the image there were names of landforms which were glacial or periglacial in origin. 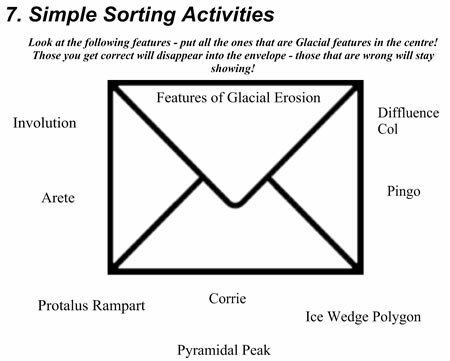 The aim was to sort the landforms into the two types by putting all the glacial landforms in the envelope. If students got it right the landform name would disappear when they drag it onto the envelope, if not the landform would stay visible so they drag it back. This can be adapted for any sorted activity – you could for example in english, distinguishing between verbs and adjectives and the image can be changed accordingly – for example you could have a clip art image of a post box for words to be ‘posted’! To do this simply use the ‘order’ function. Insert your image and text – then taking each text box in turn you need to ‘order’ it. Anything that is correct and you want to disappear when dragged on to your image, right click, select ‘order’ and ‘send to back’. You are then ready for students to sort – any ‘correct’ answers that you have set to be sent to the back will disappear when you drag them over an image, whereas anything that is ‘wrong’ will stay showing. It is easy to add a variety of multimedia to a notebook to make it more interactive and to make use of a varity of audio-visual images. Simply select the ‘Insert’ option on the toolbar, select the type of file you want to insert and you will then need to use the browse function to locate on your computer or memory pen the resource you want inserting. Remember if you are adding video files to actually be embedded in the notebook page that you will need to make sure it is in a Flash Video format (with the extension .flv). Video files can easily be converted to .flv files using software available online, for example zamzar. This is a really simple technique which enables you to hide text, answers, photographs etc.. and then reveal quickly by simply moving the eraser over them. In my example I created a clozed style exercise, with a piece of text with some key words missing that students need to fill in. Simply insert your text, image etc. as normal. Select pen from the toolbar at the top, click on the formating button at the side and select Line style. Change the font colour to white (or the colour of the background you are working on) and select a thicker line depending on how big an area you want to mask. Then using your pen simply scrible over the word or image you want to make disappear. This will then cause it to blend with the background and to students appear invisible. 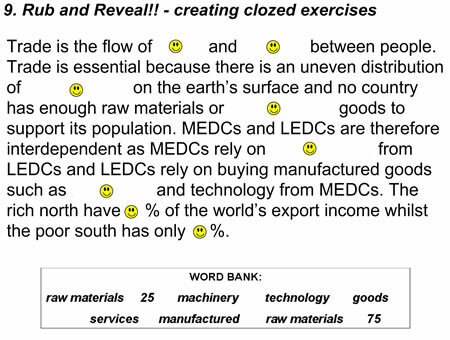 You can then reveal the word/ image etc.. when going the exercise by simply using the eraser. This is also a useful technique for when you want to hide small components of a page (which are too small to use the screenshade for). There are two parts to this tip, but both involve the idea of transparency. 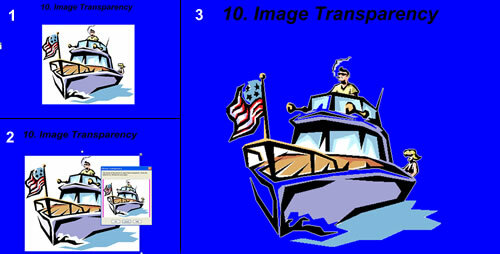 The first is setting part of an image transparent so it blends with the background. This is particularly useful if using clipart. Often an image will be on a whitebackground and if you are trying to insert this on a notebook page with a coloured background you are left with your image as a square with a white background. To make the white part of your image transparent, simply insert your image (to do this select ‘Insert’ (on toolbar), followed by ‘Picture File..’ and browse for your image). Then right click on your image and from the pop-up menu select ‘set picture transparency’, this will bring up your image in a little box, on this small thumbnail image click the colour you want to make transparent (e.g. if you want the white area to not show on a coloured background click on the white) and hey presto!